The Minnetonka Matt Team makes you feel as if you are their only client. They went out of their way to ensure that we got the house we wanted. We felt they were working hard for us even when we were not around. We recommend Matt to everyone we know!. 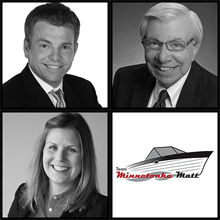 - Katie & Drew W.
There are five things that make the Minnetonka Matt Team successful: Honesty, Integrity, Knowledge, Service and Patience. This is a team that really works for you. - Richard & Carey A. Sold!! We are sold on the Minnetonka Matt Team! Our house had been on the market previously with another agency. Matt felt we needed a different strategy and he was right. We accepted an offer that met our objectives within one week after the house was listed. - Dave and Sharon I. 13754 46th Lane NE St.